Termite gut: Nature’s microbial bioreactor for digesting wood. 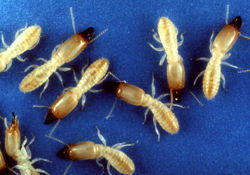 Termites can be many colors whether it is yellow, white, clear, tan, or black. Termites are insects that live in wood as colonies. Their colonies have only three castes and they are soldiers, workers, and swarmers. The workers and soldiers are the only termites that are wingless and restricted from leaving the colony. The swarmers have long veined wings so they are in a way like the scouts for the colony. Although some people may mistake termites for ants due to the mouthparts, but you can tell the difference by the waists because termites have thick waists. Also their beadlike antenna look somewhat thicker or bigger than the ants. This is another type of Termite habitat and this one is high towards the top of a tree is a big lump called a Termite nest. This is the inside of a wall in a house and all the damage that was caused by an infestation of Termites. This is the destruction of Termites and what you see is the remains after their passing. Isoptera by College of Agriculture and Life Sciences. 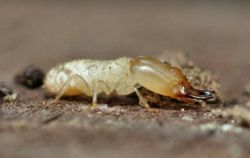 TERMITE CONTROL: Answers for Homeowners by Mike Potter, Extension Entomologist. University of Kentucky College of Agriculture. This page was last modified on 28 July 2014, at 22:46.